A new species of a giant dinosaur has been found in South Africa’s Free State Province. The plant-eating dinosaur, named Ledumahadi mafube, weighed 12 tonnes and stood about four metres high at the hips.Ledumahadi mafube was the largest land animal alive on Earth when it lived, nearly 200 million years ago. It was roughly double the size of a large African elephant. Ledumahadi mafubeis one of the closest relatives of sauropod dinosaurs. Sauropods, weighing up to 60 tonnes, include well-known species likeBrontosaurus. All sauropods ate plants and stood on four legs, with a posture like modern elephants. 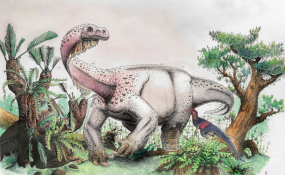 Ledumahadi evolved its giant size independently from sauropods, and although it stood on four legs, its forelimbs would have been more crouched. This caused the scientific team to consider Ledumahadian evolutionary “experiment” with giant body size. The research team developed a new method, using measurements from the “arms” and “legs” to show that Ledumahadiwalked on all fours, like the later sauropod dinosaurs, but unlike many other members of its own group alive at its time such as Massospondylus. The team also showed that many earlier relatives of sauropods stood on all fours, that this body posture evolved more than once, and that it appeared earlier than scientists previously thought. Ledumahadilived in the area around Clarens in South Africa’s Free State Province. This is currently a scenic mountainous area, but looked much different at that time, with a flat, semi-arid landscape and shallow, intermittently dry streambeds. The partial foot of a large sauropodomorph dinosaur found by Kathleen Dollman and collected near Dordrecht, Eastern Cape during a field trip earlier this year. Credit_Dr Pia VigliettiThe research team behind Ledumahadi includes South African-based palaeoscientists, Dr Emese Bordy and Dr Jennifer Botha-Brink, from the University of Cape Town and the South African National Museum in Bloemfontein, respectively. Copyright © 2018 Wits University Press. All rights reserved. Distributed by AllAfrica Global Media (allAfrica.com). To contact the copyright holder directly for corrections — or for permission to republish or make other authorized use of this material, click here.